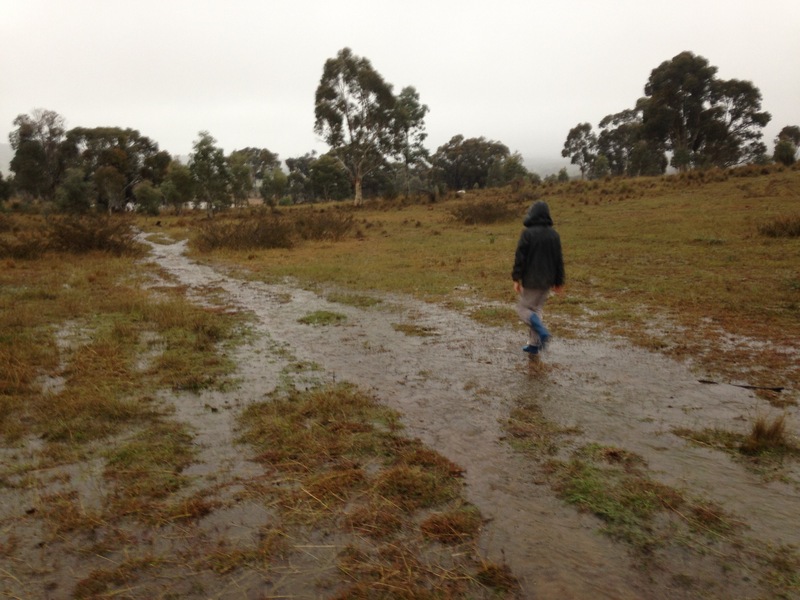 Over the past weekend, the Rock Farm was treated to a steady 90mm of soaking rain. 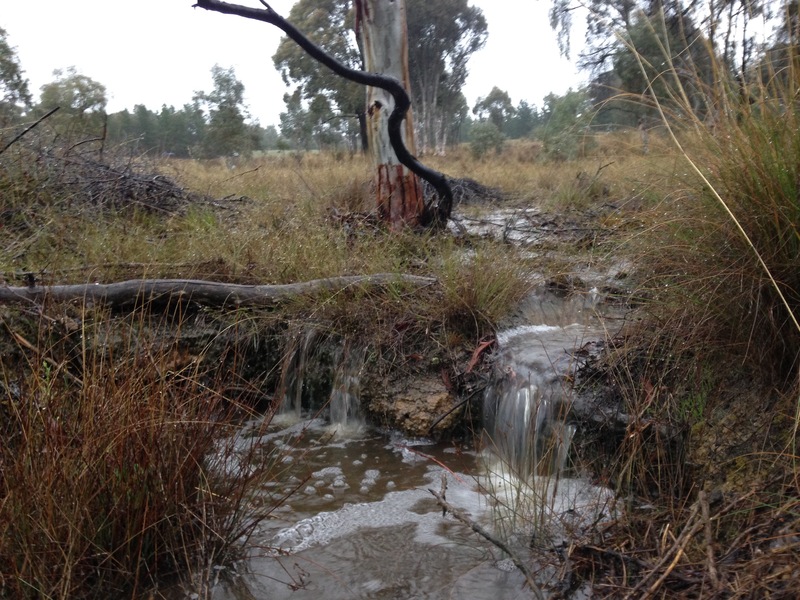 It was glorious, wonderful soaking rain that replenished tanks, dams and the soil with precious moisture. 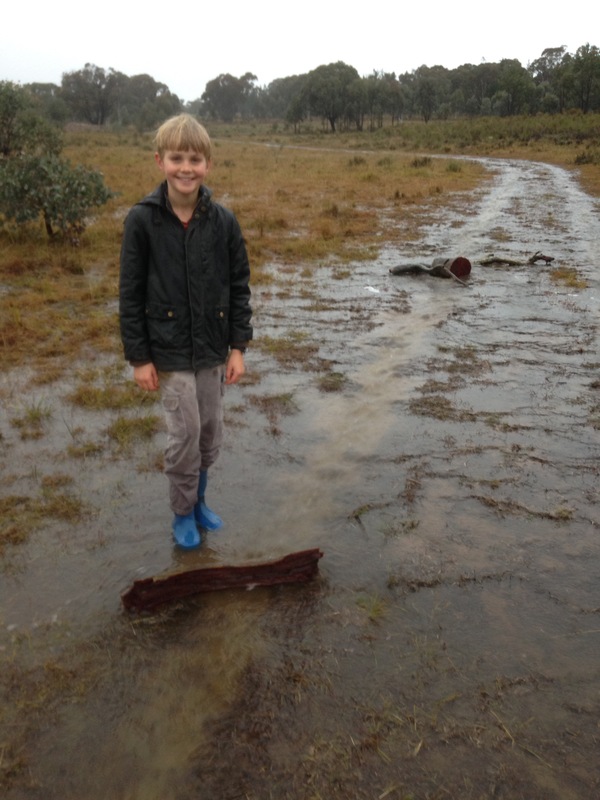 It also soaked the local Scout camp over the weekend – but the country kids didn’t seem to mind too much. Of course many other parts received far more rain than they really wanted, so we consider ourselves extremely fortunate with our rainfall. And so the rain fell – apologies to Stephen Fry for my attempt at a poetic title (See The Ode Less Travelled). It was a good time to take a walk and check out the Rock Farm in an unusually wet state. Most importantly I was keen to see where the water was soaking into the ground and where it was running. 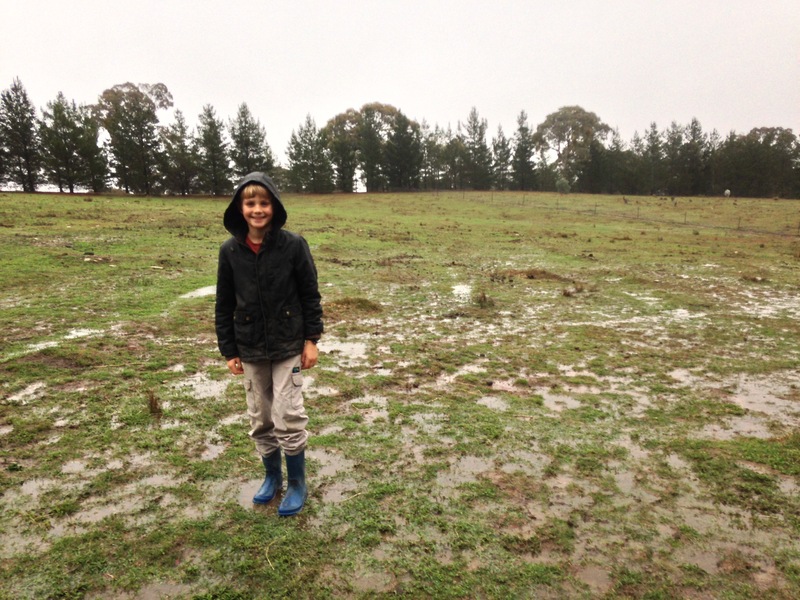 So The Little Helper and I donned gum boots and rain coats and proceeded into the paddocks. The ground was sodden and water was pooling in the surface. 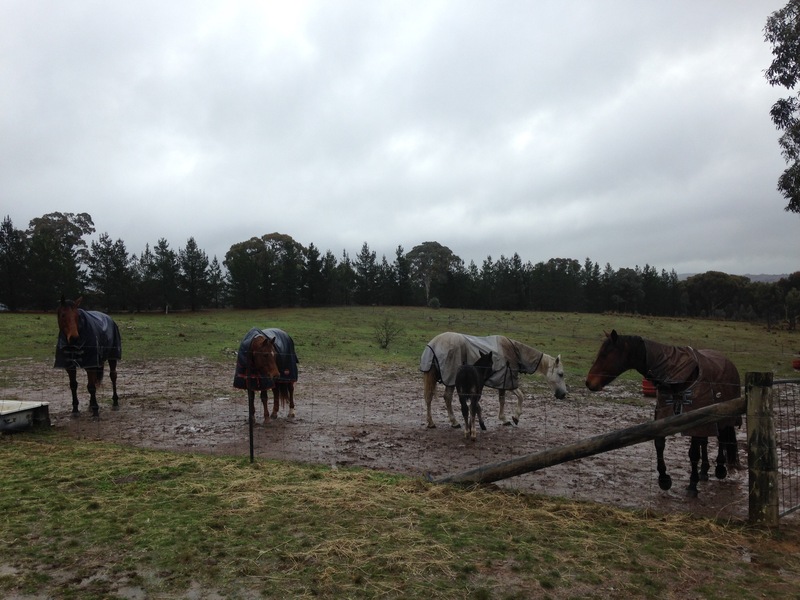 Our first stop was the little paddock behind the house. This paddock has previously had rip lines put in, and these catch the water and help prevent it running down the slope. In dry times, the lines can be easily seen because they hold the moisture and the grass stays greener longer. It is also the warmest paddock on the farm – and the animals often move here on really cold frosty nights as it is the highest place on the Rock Farm. A bit further down the slope, the water had formed streams that were running into the dams. I was really pleased to see that the water running was clear, meaning our soil was not mobilised in the rain. Of course running water carries the real risk of soil erosion, and once the soil is gone, it cannot be replaced. The Little Helper and I paused to check out some little gullies that are on this slope. The water naturally runs in this valley during heavy rainfall forming temporary streams. The little gullies are a bad sign, and I have been putting garden clippings and other material into the gullies in an attempt to slow the water down and reduce further erosion. The technique, inspired by Peter Andrews seems to be working. One day I’d like to dig a series of ponds on this slope to really slow and hold the water in the paddock for longer. In the meantime, the garden waste seems to be providing a good barrier to slow the water and allow the bare earth to revegetate. It wasn’t all going to plan though as this little water-fall shows. At least the water crossing over it was clear. The pooling or ponding was also occurring naturally, particularly under this ancient Brittle Gum (Eucalyptus Manifera). It helps that the slope here is less steep, and this means the leaves and natural mulch can form effective barriers to slow the water down too. I had never seen so much water in the dam in the background. The water was flowing quickly out the over flow, and this is where things started to get a little less positive for us. 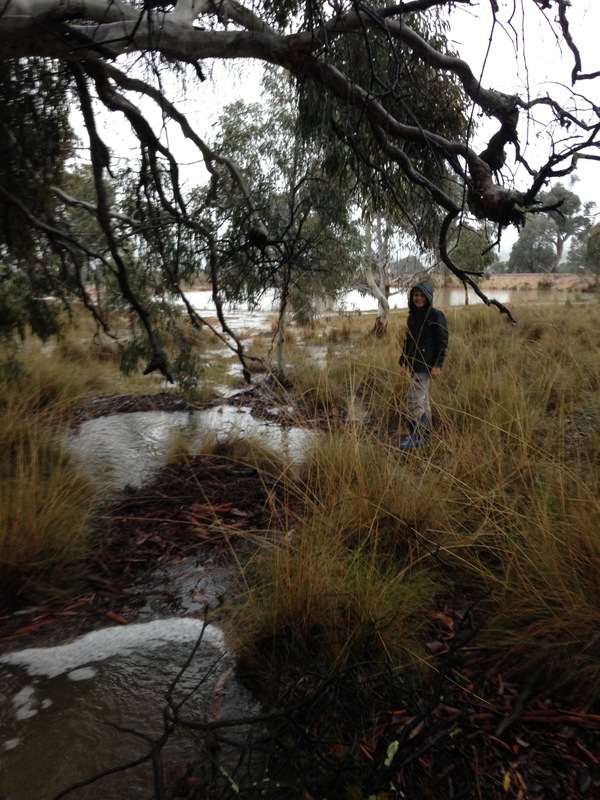 The water was racing down a two wheeled track that had formed between the two dams. It was running quickly, and without the natural grass and other shrubs to slow it down, the water wasn’t soaking into the soil. 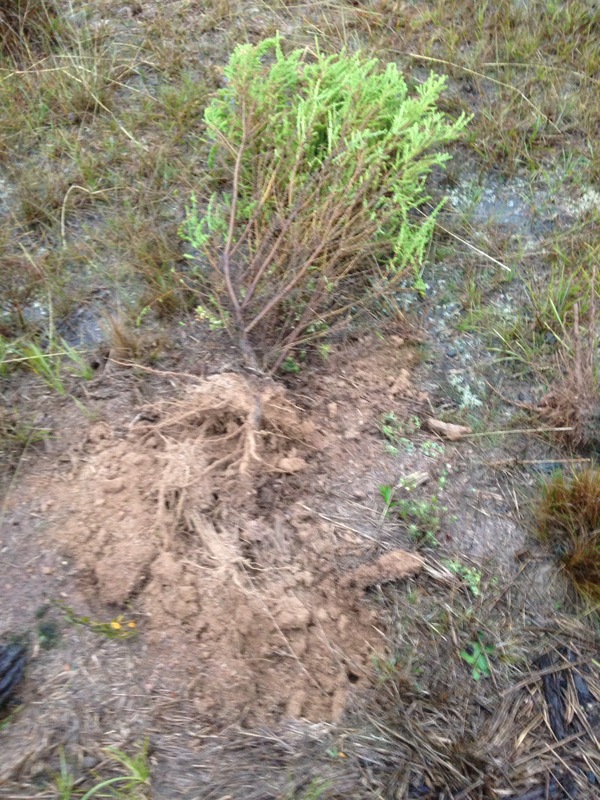 A quick test (pulling out a sifton bush weed near the track) revealed how little the water had soaked into the ground. So I press ganged the little helper into service. 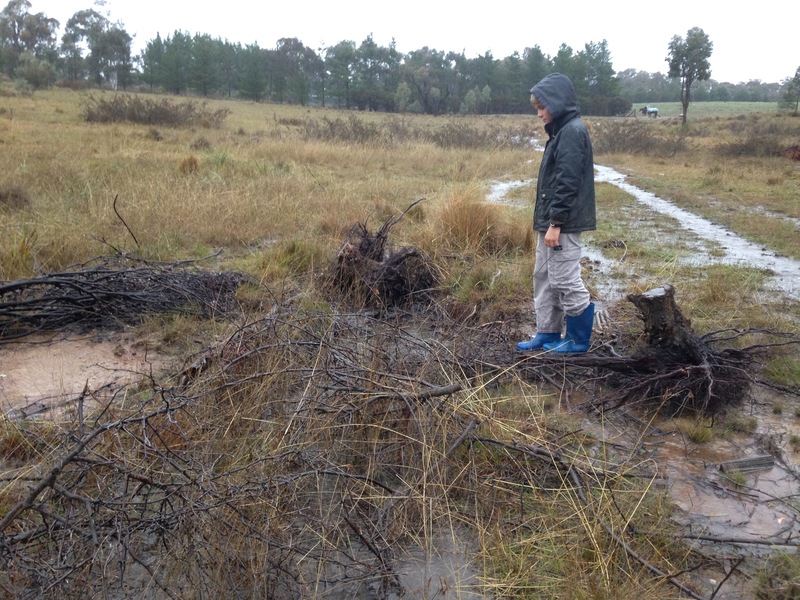 We moved a few logs and stumps into the flowing stream, in an attempt to divert the precious water into the grassy parts of the paddock. We hoped we could get it to slow down and soak into the soil. Our plan was moderately successful, but will require a lot more work before I am happy with it. The scary thing is that I rarely drive this track and in the last 18 months or so ave asked the family not to drive it at all if it cannot be helped. It hasn’t rejuvenated. This part of the Rock Farm will take a long time to heal, and without the benefit of heavy machinery that can rip up the soil and aerate it again, I will have a lot of work to do to slow this water down and get it back into the soil. It is funny that a few hours later I was digging drains out on our lane – with roads the priority is to get the water off the road as quickly as possible. In the paddock we want to slow it down and give it time to soak in.